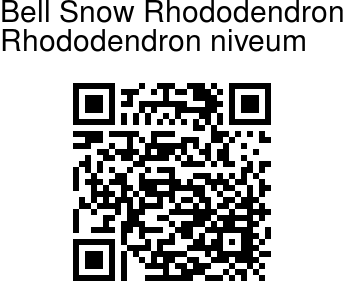 Bell Snow Rhododendron is a shrub or tree, 2-6 m tall. Flowers are borne in a spherical dense 15-20-flowered cluster, with rachis about 2 cm, yellow velvety. Flower-stalks are about 1 cm, densely white- to rufous-velvet-hairy, calyx teeth minute, 1-2 mm. Flowers are tubular-bell-shaped, deep magenta to deep lilac, 3-3.5 cm, with 5 deep purple basal nectar pouches. Stamens are 10, unequal, 1.8-2.8 cm, filaments hairless. Ovary is cylindric or oblong, about 6 mm, densely whitish to tawny-tomentose, style hairless, stigma capitate, small. Older branches are brownish, becoming hairless. Branches are about 6 mm in diameter, below inflorescence. Young shoots are grayish green, densely velvet-hairy. Leaf-stalks are 1.3-1.5 cm long, leaves leathery, inverted-lanceshaped to elliptic, 8.5-11 x 3.6-4.6 cm, base tapering or rounded, margin curled, tip blunt or rounded, apiculate. Underside has 1-layered indumentum densely compacted, fawn, glabrescent, hairs dendroid, upper surface of unfolding leaves scattered white floccose, at maturity hairless. Midrib is prominent below, grooved above, lateral veins 11-16 on each side. Capsule is shortly cylindric, blunt, 1.5-1.8 cm, blackish, roughened with vestiges of tomentum. 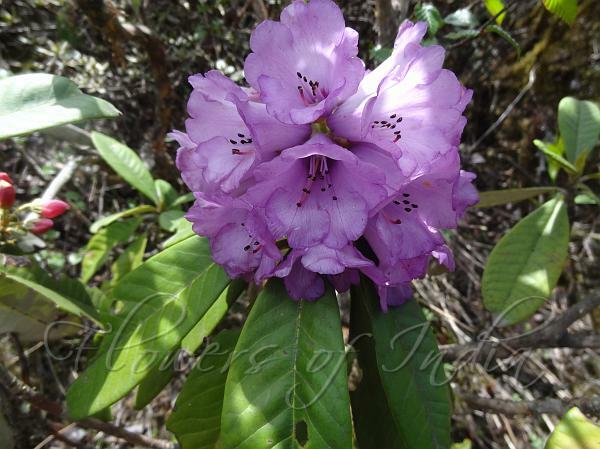 Bell Snow Rhododendron is found in the Himalayas, in Bhutan, NE India, Sikkim, ata altitudes of 2600-3500 m. Flowering: April-May. Identification credit: Sanjyoti Subba Photographed in North Sikkim.